Haier America recently released their very own portable media player. It’s a simple music, photo, and video player available in 4 and 8 GB capacities. I didn’t expect much when I picked it up, but for the price it packs quite a punch. It even has a FM radio and voice recorder built right in. There’s no question, this device can’t compare to the quality of an Apple iPod Nano or Microsoft Zune, but it’s an affordable alternative which deserves a quick look. The design of the Haier media player is very simple. The face is slightly elevated, and the edges curve off into the side. Below the 1.8″ screen, the player includes touch sensitive buttons for the menu, volume, left/right, and “ok”. All these keys light up blue and are embedded into the body. That unfortunately means buttons are difficult to find when you aren’t looking at the device. The built in microphone and the power button slider, which also locks the device, are on the left side. There’s a small reset pinhole on the right side, which I hope doesn’t need to be used. Despite the player’s sleek and simple look, the glossy finish and mirrored back makes it a great finger print magnet. I found myself cleaning off the front constantly just to be able to see the display. The sliding key also had a few issues since it’s too small. If you have large hands, it’s hard to be able to slide and hold up for a few seconds to get it to turn off or on. But once again, for the price, I was pleased with the design. The music playback features on the Haier were quite satisfying. It includes all the standard actions such as play, pause, and track navigation. There’s even a repeat function and equalizer setting built in. The sound quality was decent for the average person, audiophiles probably won’t be picking this up anyways. The player doesn’t allow viewing images while music is playing. It’s not a big deal, but most other players offer this feature. The biggest lacking was the inability to display album artwork while playing music. This media player also didn’t support shuffle or playlists. Even for an inexpensive player, some of these issues are essential and almost necessary for any music player. When this came in, I assumed that I would be able to play movies on it. I was wrong. I transferred some common .mp4 and few other video formats onto it. Nothing worked. After looking through the manual I was disappointed to find that it only supported a .smv video format. I don’t know much about that format since I’ve never heard of it until I got this. They offered a tool to convert videos into the format, so I downloaded and installed it. I found that even on a fairly fast dual core laptop, it took way too long to convert. I threw in a 890MB for conversion and it took a few minutes for each percent. Music playback was decent, but Video support just isn’t practical. It’s there, but too much of a headache to deal with. If there was one thing that was great on this, it’s the radio. Browsing through radio stations was easy and I was even able to create a list of 20 favorite channels. That’s a convenient so I don’t have to scroll through each station every time I turn the device on. Plus I only listen to a couple of stations in my area anyways. There wasn’t a scan function, but holding the left or right button jump to the channels with the best signal. It’s a fairly small device so the signal quality was disappointing at times, but that’s expected for anything with such a small receiver. For the most part, the radio worked just fine. The microphone on the Haier is located on the left side of the player. Surprisingly the audio quality that came out of a few recordings were quite impressive. I recorded a lecture and even a conversation I had with a friend in a quite room. They all sounded pretty clear without any static or interference. Recording duration is only limited by the space on the device. The player unfortunately doesn’t let me delete recordings without having to connect it to a computer first. This might be an issue at times if you run out of space and can’t get to a computer. Considering the Haier Video MP3 Player costs around $49 for a 4GB model, you can’t go wrong. The biggest drawback is the limitations of video playback. It’s just not worth spending the time to convert standard and commonly used file formats into something random. Plus with a small 1.8″, I probably wouldn’t want to load much more than a few music videos and YouTube clips onto it. The rest of the device worked fairly well. The inclusion of shuffle and playlist feature would have been appreciated. The best part is the simplicity of syncing. It even worked perfectly with Ubuntu 9.04 in addition to Windows 7. It’s just a simple mass storage device. Anything placed on it will be detected after it’s disconnected. If you are looking for first MP3 player for children, the Haier Video MP3 media player is a great place to start for an affordable price. Haier recently released their very own portable media player. This 4 GB player packs quite a punch for such a small and inexpensive device. In addition to playing music and video, it holds photos, has a built in FM radio, and even features voice recording. 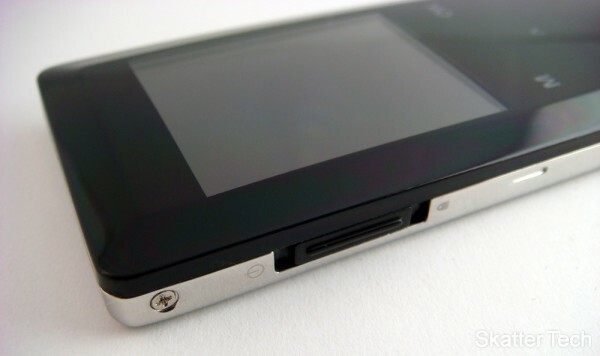 The Haier shares the same form factor as the iPod Nano. Similar to the iPod, the design of this media player is very simple. Due to the face being slightly elevated, the player has more of a three dimensional feeling to it. Underneath the 1.8″ screen, the player includes the buttons for the menu, volume, left & right, and “ok”. All these touch buttons light up blue and are integrated into the body, so you do not feel them. 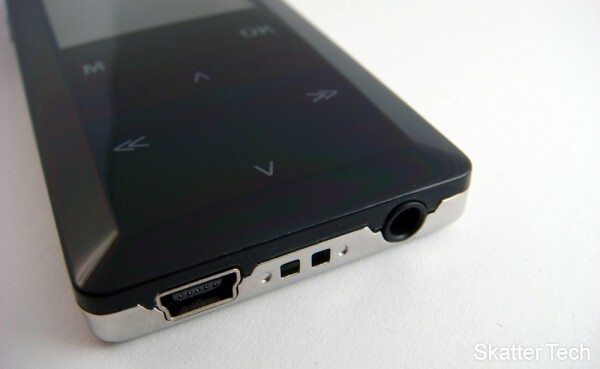 The built in microphone and the sliding key, used for turning the phone on and off as well as for locking the phone, are located on the left side. On the ride side, another small pinhole for the reset function can be found. 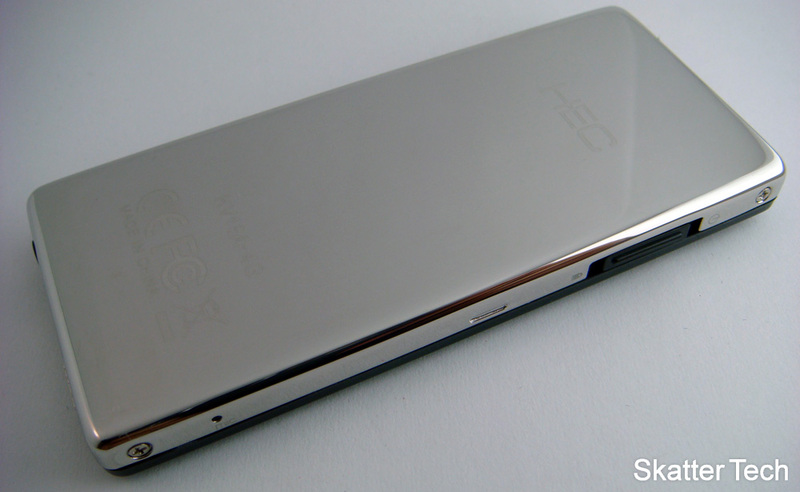 Despite the player’s sleek and simple look, the glossy finish and mirrored back creates an issue with cleansiness. I had to clean the player constantly because of how prominent my finger prints showed up. The sliding key on the left side also created a minor problem. When turning off the player, I found that my finger sometimes slipped off of the key due to the small size and the stiffness. The key has to be pushed up for a few seconds for the media player to turn off. Other than that however, I was pleased with the Haier’s design. We were satisfied with the music feature on the Haier. It includes all the standard buttons and some features (repeat, sorting, equalizer).The sound quality was great and I had no problems with it. While playing around with the player, I noticed that I was not able to view photos at the same time as I was listening to music. This did not bother me, but it would have been nice if that feature was available. Also, if you have album art, it will not display when playing music. I was surprised to discover that this media player does not feature a shuffle function or a playlist feature. This was a big turn off for me because I use both of these standard features frequently when I listen to music. Even though you can watch movies on this, it took too much work to try to do so. I originally thought I could drag and drop .avi or .mp4 files onto the player after syncing with it, as I did with music, but this was not the case. I had to download 3rd party software to convert my files to a .smv file. I cannot comment on .smv either because up until using this product, I had never heard of that kind of file type. I did download the recommended software to convert files to .smv, but the conversion took much too long. I timed how long it took the converter to convert just one percent of the file: for a 890MB file, it took on average about 2 minutes or longer. With other converters and file types, this movie would have taken a maximum of one hour to convert. The FM radio feature on the Haier performed well. In addition to browsing through radio stations with ease, I am even able to create a list of up to 20 of my favorite channels. This really helped me because it would have been very annoying to search through the stations each time I turned on the FM radio. There is no scan function, but I can hold the left/right buttons in order to go to the channel with the best signal. However, the quality of the picked up signal was disappointing at times. Even when I was out in the open walking to class, some of the stations that normally would play on a radio were distorted or did not play well. For the most part though, I could listen to most stations well. The microphone on the Haier is located on the left side of the player within a small hole. For such a small hole though, the quality of the recordings is impressive. While I sat about a foot away from the media player, which I placed on my desk, I talked in a normal voice in no particular direction. I was able to hear everything I said with out any static or interference. Also, I was able to record up to the space available. The only minor issue I had with the inability to delete the recordings right away. If for some reason I had to re-record something, I had to plug the Haier back into my computer to manually delete the file. This is problematic because if I did not have access to a computer, and space fills up on the player, then I would be unable to record anything new. All in all, with a good $49.99 4GB media player, you can’t go wrong. The only issue I had was with the video player. However, this doesn’t mean the player doesn’t work. It took too long to convert any movie to a .smv file. Since the screen itself is only 1.8″, I don’t feel like the quality of the video would have been that great anyway. All the other features on the media player performed well enough for me to overlook the video issue. The two big issues I had with the music player was the lack of the shuffle and playlist feature. However, the music quality itself is excellent. Also, syncing with the Haier is extremely easy; I use Ubuntu and all I had to do was plug in the player and drag & drop any file I wanted to put onto the Haier. Due to the clear quality of the radio, the FM transmitter was probably my favorite feature. The microphone was also a great functional, but personally, I would rarely use it. In conclusion, the Haier portable media player is worth the price; I have even seen some websites offering this player at a lower price. Can you post an image of what the music screen looks like when music is on it? Also can you post another picture of what the file browsing looks like, I want to know how many lines of text it has.